If you are a fan of 12-fret dreadnoughts, please check out this one-of-a-kind beauty built for Martin's 2017 "Dreadnought Centennial" event. This 12-fret slope dread has features you won't typically find on this type of instrument. Further, this guitar is a "new old stock" model that has never been retailed previously and is in pristine, unplayed condition. 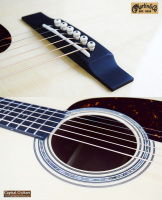 This custom guitar is a 12-fret, slope shouldered dreadnought with a 25.4" string scale. 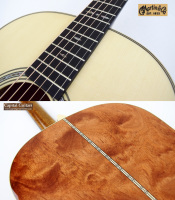 It has an Italian Alpine Spruce top with scalloped 5/16" Adirondack bracing in a forward-shifted pattern. 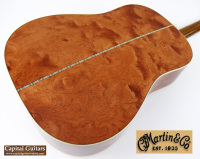 The back and sides are made from a gorgeous set of quilted Bubinga, a tonewood many consider a great compromise between the characteristics of Rosewood and Mahogany. Cosmetics include European flame Maple body binding, a 45-style Marquis Abalone rosette and 28-style black and Maple purflings and inlays. 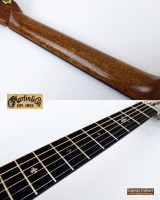 The Mahogany neck has a sleek Performing Artist profile and is equipped with an adjustable 2-way truss rod. The Black Ebony fretboard has a 16" radius, G-300 (.080" x 0.037") fret wire, a 1.75" bone nut and custom "Torch" Abalone inlays. The bridge is a Black Ebony 1930 Belly style unit with a drop-in bone saddle with 2-3/16" string spacing. 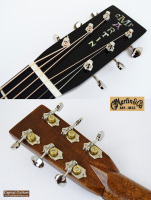 A flat, square headstock was chosen (for easier string changes) and it comes with an Ebony overlay, select Abalone inlays and Grover nickel tuners with vintage style buttons. This guitar is loaded! If the cosmetic beauty of this guitar haven't already gotten your attention, you will really love it as soon as you play it. Most Martin D-12's come with a thicker, more vintage style neck, while the slimmer PA neck shape on this beauty make it super-easy to play, particularly for players who like Taylor-style neck shapes, or often play electric guitars. The setup is perfect, with 9th fret string heights of 6/64" on the low E side and 4/64" on the high E side, with .02" of relief. This guitar is a player! The tone of this guitar is magnificent and it's presence is astounding. 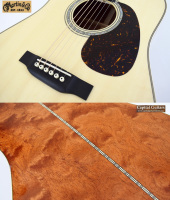 The 12-fret dreadnought's natural low end power is combined with an Alpine Spruce top and forward shifted bracing providing note clarity and top end, while the Bubinga provides warmth and body. Check out the brief sound sample provided and I think you will agree, this guitar has a voice that is simply superb! 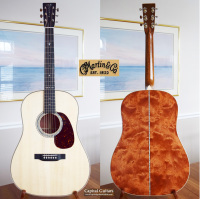 As noted previously, this guitar was built for Martin's "Dreadnought Centennial" event that was held in January, 2017. It has never been sold, although I cannot imaging why. As such, it is in dead mint condition. 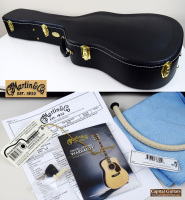 I cannot offer a warranty as I am not an authorized Martin dealer, but in all other respects this is a new instrument. It comes in it's similarly mint and original Geib-style case with all the paperwork, end pin, etc. 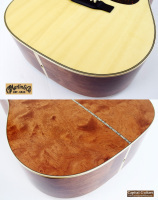 Get yourself this amazing and one-of-kind 12-fret slope dread. 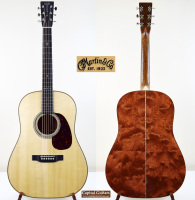 An amazing and unique instrument from the Martin Custom Shop that is sure to please!